Summer of Sonic Sets a Guinness World Record! A few years ago, shortly after the idea of a Sonic convention was first brought up in a small cafe in London, the idea was pitched to a few members of the Sonic community and one of the more joky responses was the above. But despite a few ‘are we sure this is good idea’ reactions, Summer of Sonic 2008 went ahead, and people actually turned up. Since then it’s gotten bigger and bigger and it would appear that it’s getting noticed in circles outside of the Sonic fan base. In the recently published Guinness World Records 2014 Gamers Edition. Summer of Sonic has set a Guinness World Record! 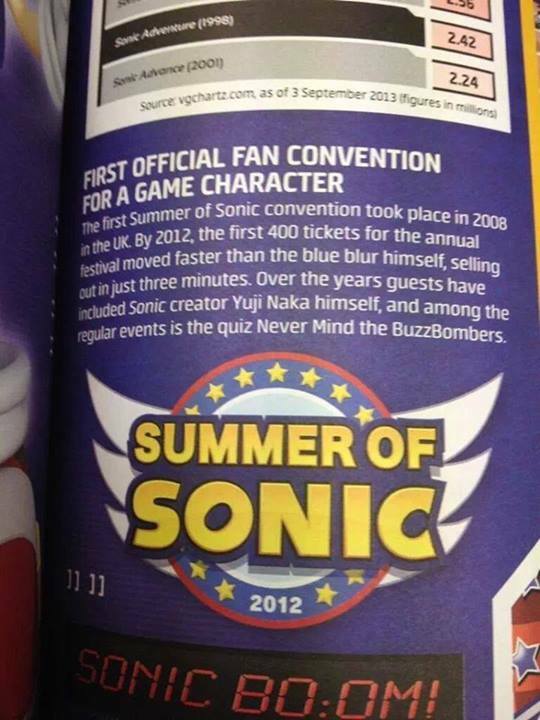 It turns out that not only was Summer of Sonic the first officially recognised Sonic fan Convention, but it’s also the first official fan convention for a video game character! Congratulations to everyone involved with Summer of Sonic, both past and present, and congratulations and thank you to everyone who has attended and supported the event. Since without you lot, we probably would have had to invite the drunks from over the road! Source: Guinness World Records 2014 Gamers Edition Via SSMB Member Lucky. The annual fan convention Summer of Sonic has updated it’s website, and things are a bit darker than normal. In what will be the conventions 6th year a teaser site has gone live which doesn’t show us much, but there are one or two clues. Most noticably are tiny outlines of Sonic & Metal Sonic along the bottom of the site and do we need to point out the matrix style numbers in the background? Also, if we take a look at the official Facebook & Twitter feed, things seem a bit… different? What could it all mean? Although you’re still going to have to wait another five months for the event itself, the Summer of Sonic website is now up and running with a swanky new look and a funky-fresh logo! Although nothing is being revealed yet and ticket applications have not been announced, you can still head over to the site and register your interest for the event. 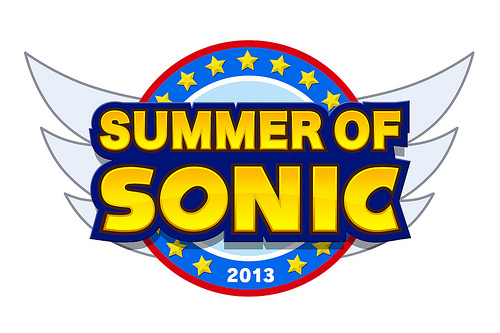 What’s more, Summer of Sonic is always looking for fan input – so the question is put to you guys and girls….do you have any great ideas for Summer of Sonic? Maybe you’d like a particular guest to come along, or an old face to return? If you do, head over to the SoS site and let the team know about it in the comments! At the end of Summer of Sonic everyone paid tribute to Sonic with a massive cake – except it wasn’t for him but for someone else! Then ArchangelUK has to ruin it all naturally by reminding everyone that Rory and Svend still owe him the Wrecks Factor forfeit and that they would be singing the DK Rap.